Vampire: The Requiem, like all Chronicles of Darkness games, has a “morality stat” which tracks how your character copes with the central conceit of horror in the game. For Vampire, this is called “Humanity” and it tracks how far from human your character has fallen. 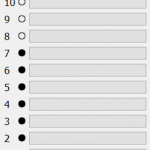 This is displayed as a vertical list of dots with a text field that allows you to enter persistent conditions your fall from humanity has caused. 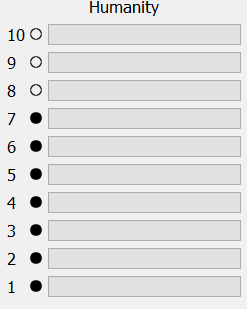 In Dicecord, I chose to make this a column of labels, dots and buttons. The labels are all numbers from 1 to 10. In edit mode, users can click on the dots to change their humanity rating and click on the buttons to add a name + tooltip for the condition. The UI is currently just a placeholder. Next week I will reduce the size of the button and make it display as an empty horizontal line. Like other Chronicles of Darkness games, Vampires have a resource that powers their special abilities. Their resource is called “Vitae” which is distilled from the blood they drink. The UI object for Vitae is basically a much simplified version of Mage’s mana. In Mage a character has access to both their own store of mana plus any mana stored in their enchanted items or artifacts, however in Vampire you only have access to your personal store of vitae. Like other Chronicles of Darkness games, vampires have access to powers collected into specific sets. In Mage these powers were called “Arcana” and all mages can conceivably master all Arcana. In Vampire, they are called “Disciplines” and they are mainly based on your Vampire’s clan. Typically Vampires will only master disciplines for their clan, although there are ways they can learn out of clan disciplines. In addition, while mage only has the specific set of 10 Arcana vampire disciplines are open ended. This open ended nature coupled with the generally small number of disciplines meant that rather than listing all of them like in Mage, an approach similar to merits had to be taken where users enter in custom names for each discipline. Like merits, they can also add a tooltip that summarises the powers afforded to them by the discipline. To build this object I took the merits object and rewrote it as a generic object that takes a heading as an argument. In addition, I rewrote the merits object to merge the “merit” and “merit details” dictionaries; creating a single merit dictionary that holds the name, rating and tooltip of every merit. This object is going to be very useful for future gamelines. For example, in changeling you have 2 different lists of custom stats with their dot rating that can be easily created with this object. Finish the UI for the Humanity object. This entry was posted in Dicecord and tagged project update, Python 3. Bookmark the permalink.